For many baby boomers, the first images of war they remember did not come from the news. Instead, they were from an extremely popular documentary television series that aired on NBC in 1952 and 1953 and was subsequently made into a feature film. Some children watched Victory at Sea in the company of a family member who had served in the United States Navy during World War II. I suppose the reason I got to watch it so frequently was because of my growing interest in ocean liners. Those who did watch Victory at Sea were profoundly moved by its musical score, most particularly the theme music by Richard Rodgers. As children, we had no way of knowing that Rodgers (together with his lyricist partner, Oscar Hammerstein II), had been part of the creative team behind 1949's hit musical, South Pacific. By March 19, 1958, when the film version of South Pacific was released in first-run theatres with Mitzi Gaynor and Rossano Brazzi taking over the lead roles from Mary Martin and Ezio Pinza, Rodgers and Hammerstein had added to their legacy with The King and I (1951); a television version of Cinderella (1957) starring Julie Andrews; and were preparing Flower Drum Song for its Broadway premiere on December 1, 1958. The following year witnessed the premiere of what would be their last musical, The Sound of Music (also starring Mary Martin). Following Hammerstein's death on August 23, 1960, Rodgers wrote both the music and lyrics for two songs that were added to the film version ("I Have Confidence" and "Something Good"). 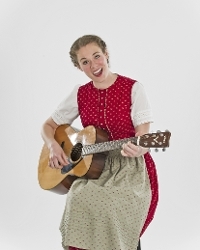 According to Wikipedia, the popular "Edelweiss" (which many imagine to be a traditional Austrian song) was written for the musical. Since the film's debut, this song (originally unknown in Austria) has become a powerful marketing tool for Austrian tourism (especially for the city of Salzburg). The popular gay dragapella quartet, The Kinsey Sicks, frequently invites audiences to join them in a sing-along of their snarky parody. Soft and pink, God you stink! Several months ago, the Contra Costa Musical Theatre presented a delightful production of The Sound of Music which incorporates the two songs written for the film and drops the Act II duet ("An Ordinary Couple") sung by Maria and Captain von Trapp after he breaks up with Baroness Schraeder and realizes the true object of his affection. With director/choreographer Michael Ryken at the helm, the staging of this beloved show was tightly paced, handsomely executed, and solidly sung. Using sets from the Fullerton Civic Light Opera and costumes by Sharon Bell, the production looked solid and, under the musical direction of Karl Pister, boasted some beautiful a cappella work from the chorus of nuns at Nonnberg Abbey. 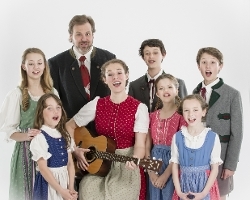 Dan LeGate was an appropriately stiff Captain von Trapp with Melinda Meeng appearing as Elsa Schraeder (Meeng performed this role last fall in the Berkeley Playhouse production). Derek Leo Miller's portrayal of the romantic young Nazi, Rolf Gruber, offered an interesting foil to Tomas Theriot's expansive characterization of Max Detweiler. While Pamela Hicks brought vocal heft to the role of the Mother Abbess, the evening's true star was Kelly Britt (a graduate of the San Francisco Conservatory of Music), whose Maria may well be one of the best sung I've ever heard. Earlier this year, the Jewish Community Center of San Francisco offered a fascinating program as authors Deborah Strobin and her brother, Ilie Wacs, promoted their new book, An Uncommon Journey. 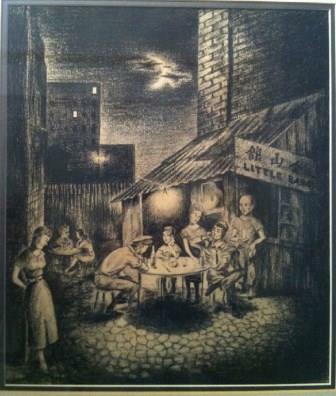 The children of a Jewish tailor living in Vienna, their family fled to Shanghai prior to the Anschluss. Strobin told the audience at the JCCSF that, as a child who had never seen any Asian people in her life, to step off the boat in Shanghai and see millions of them was terrifying. Forced to flee from their upper middle class lifestyle in Austria, the family settled into the Shanghai Ghetto where there was little food and even less privacy. There was, however, plenty of depression. It was during this period that Wacs began to develop as a sketch artist (a talent that would lead to a career in fashion design). With San Francisco Chronicle columnist Leah Garchik acting as moderator, Strobin (who lives in San Francisco) and her brother shared their experience with an attentive audience. For me, the biggest surprise of the evening came during the Q&A segment of the presentation, as members of the audience whose families had also sought refuge in the Shanghai Ghetto took to the microphone to share their experiences. Back in the 1950s, little was understood about post-traumatic stress disorder. This story, which was recently published on the BBC's website, reveals how a child learned a shocking secret about his father's experience in World War II. Many children's fathers never made it home from the war. 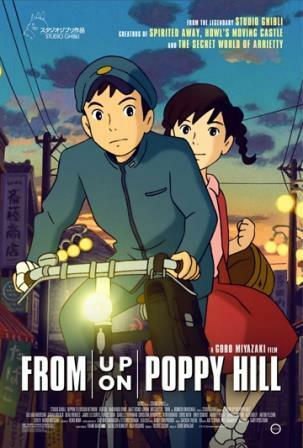 While some may view the new animated feature, From Up On Poppy Hill, as a coming-of-age story for a young Japanese girl, I saw it more as the story of a child finally being granted closure with regard to the father who could never come home. Set in Yokohama in 1963 (when Tokyo was preparing to host the 1964 Summer Olympics), the film may at first seem to center on the possible romance between two innocent high school students: Umi and Shun. Umi (whose father drowned when his supply ship hit a mine) has been living with her grandmother and cousins while her own mother is studying in the United States. 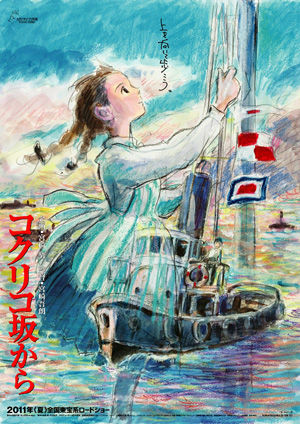 From their home on Poppy Hill, she has always run maritime signal flags up the flagpole in the front yard in the hope that her father might one day see them from one of the ships in Yokohama's harbor. Shun, whose father works on a tugboat, is one of the students working on the school newspaper. Together with the members of various student academic clubs, he hopes to save their Meiji-era club house from being demolished. Written by Hayao Miyazaki and directed by his son, Goro, From Up On Poppy Hill lacks the kind of magical realism that made other animated features from Japan's popular Studio Ghibli (Spirited Away, Howl's Moving Castle, Ponyo) such triumphs of imagination.